Mr. King—a vaguely lion-ish animal who stands upright—builds and uses an invention that harms his ecosystem in several ways. He quickly agrees with his friends’ concerns and creates another that is beloved by all. “Mr. King likes flowers. He likes that they smell good and look pretty. So when he discovers one that has been chewed by a caterpillar, he is NOT happy.” Crayon-outlined, tawny-tinted Mr. King, whose leonine ears sit astride an orange crown (possibly made of crepe paper), has an annoyed expression as he views a large chunk eaten from a green flower bigger than his head. Little ones will likely remember the cuddly-looking caterpillar on the title page, contentedly munching. The next page shows Mr. King tinkering with parts, his tongue out in concentration: “He quickly builds himself a Caterpillar-Catcher. 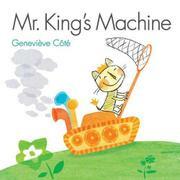 Mr. King likes machines, too.” As he zooms about on his tanklike machine, smiling and brandishing a butterfly net, dark puffs of watercolor smog fill the air. Various woodland and meadow friends, all with equally sweet and comical demeanors, work to apprehend their friend. A double-page spread fills with the reasons why Mr. King needs to change his ways, including the harm done by his machine as well as the importance of caterpillars. The text is simple, straightforward, and respectful, and the artwork is joyous and original.